1. Red wave iv completed at 2379 and it's on to new all time highs in red v (black path on the chart below). 2. The decline to 2379 was the b-wave of an expanded flat -- which would then see the market reverse (ideally) shy of the all-time high, then decline back to test 2379, then rally back up to test the highs again, then decline AGAIN south of 2379 (blue path below). While the all-time high can be treated as a stop, the challenge with b-wave rallies is that they can exceed the third wave peak (in this case, red iii) without invalidating the b-wave. But playing for b-waves in a market like this can be hazardous to one's account -- so, due to the fact that the bull option for this structure is reasonably near-term bullish, though, it would be tempting fate to be short if SPX sustains a breakout over the all-time high. RUT is interesting, inasmuch as it has now overlapped a previous high, which does hint at the potential for the previous rally to be wave B of 4. The other option that could fit this pattern, given the position of the current wave within the overall structure, is for the peak at 1425 to mark wave i of an ending diagonal. So, if RUT breaks over 1425, the diagonal would have to be given the benefit of the doubt (with the possibility for an even more bullish pattern). Until then, the expanded flat (blue B and C) should be eyed with respect. 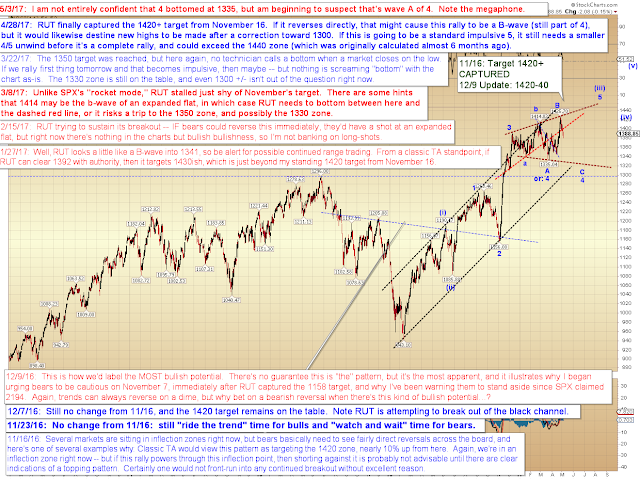 In conclusion, the market is still giving mixed signals. 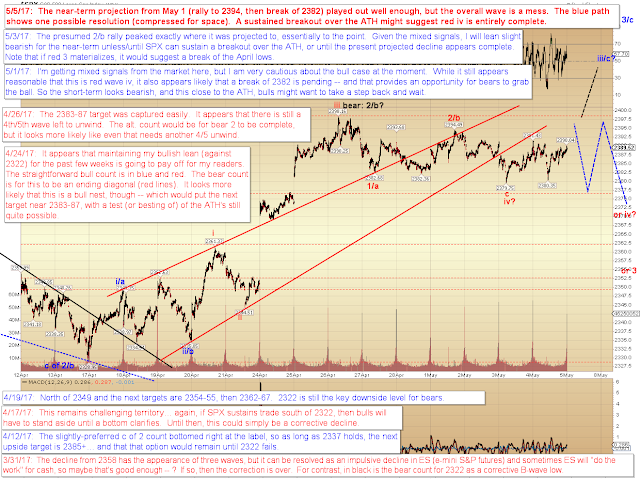 It' possible that SPX red iv (first chart) completed at 2379 and we'll head straight on to new highs, but the wave structure hasn't made that clear. 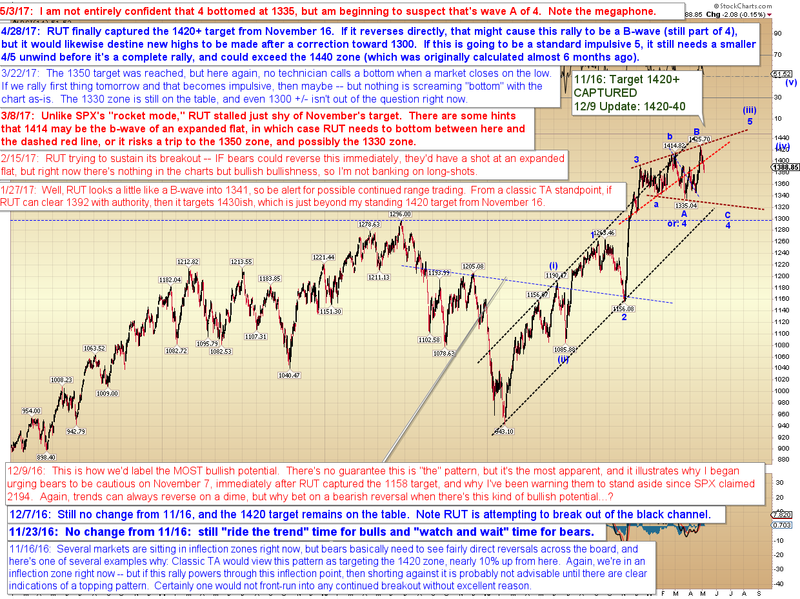 Now more than ever, it's advisable to play only the edges of the current wave, until it resolves one way or the other. Trade safe.